Welcome to the magical world of Paul C Nixon. 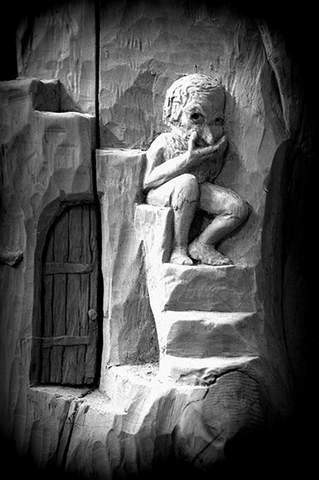 Diva's, Elementals, Fairies, Elves, Witches and more are brought to life through Paul's work as a skilled woodcarver, sculptor and photographer. When we were young, the world was filled with wonder. The wind whispered in our ears. Shadows had life and the clouds told stories. The world is full of magic things,patiently waiting for our senses to grow sharper. WB Yeats. Image size and quality have been reduced for protective reasons. 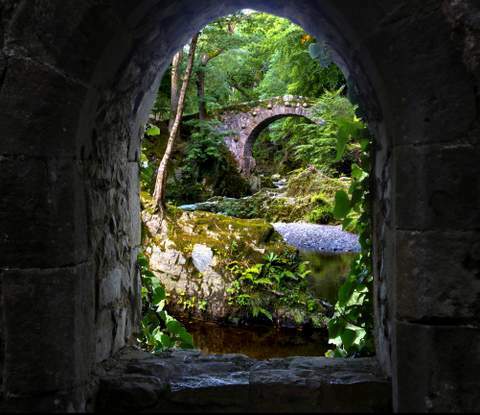 While the presence of fairies and magic is crucial to many European folk tales, Irish storytelling tradition is especially rooted in the fairy belief, and the varieties of fairy that are presented attest to this. 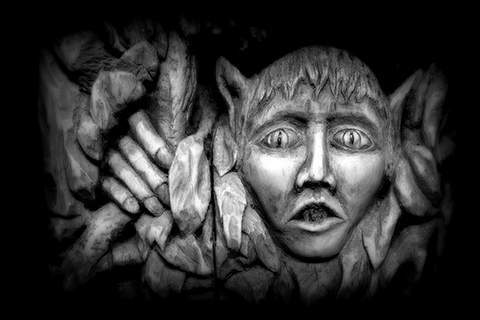 A view of the supernatural was fundamental in Irish folklore, and the fairies that populated these stories were at the heart of that belief. 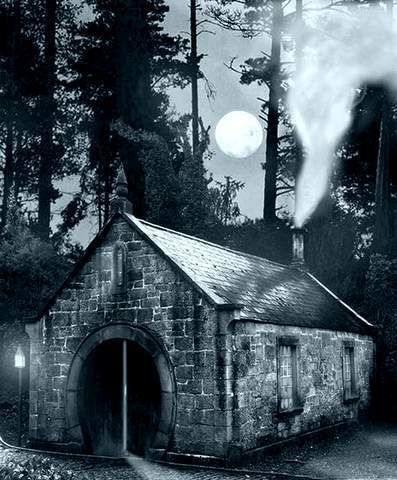 There are three major fairy types in the Irish fairy tale canon—the Sidhe (“Shee”), the Banshee, and the Merrow. 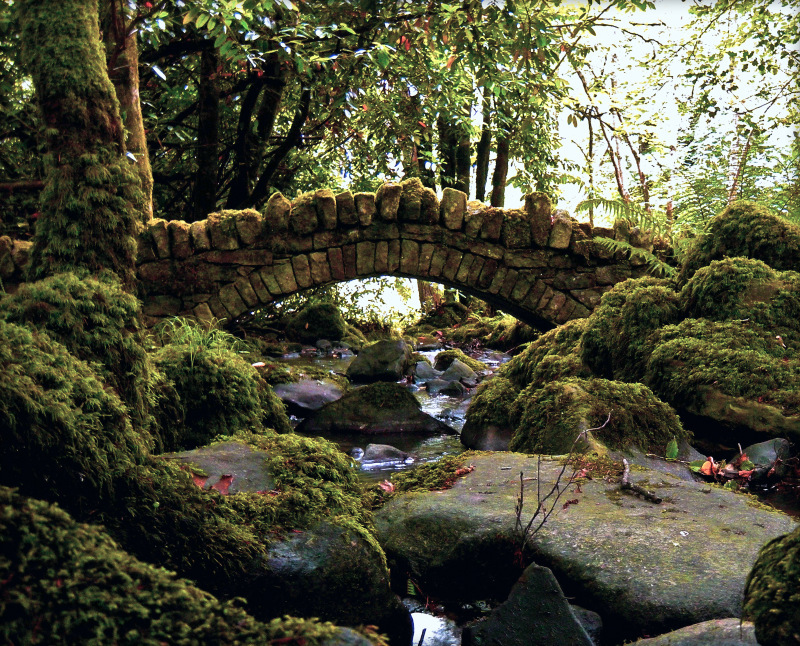 Each has its own characteristics that make it unique to Irish folklore. 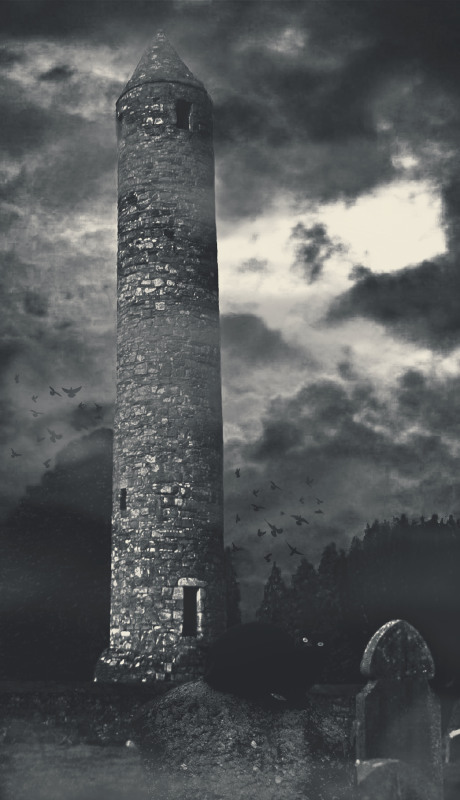 The Sidhe, or the Tuatha De Danaan, were considered a “distinct race, quite separate from human beings, and belief in this race of beings who had powers beyond those of men to move quickly through the air and change their shape at will once played a huge part in the lives of people living in rural Ireland” The Banshee was a variation of the Sidhe, meaning “faerie woman” or “woman of the Faerie mound,” an elfin creature whose mourning call signaled death approaching. The Merrow comes from the Irish word muir meaning sea and oigh meaning maid, an Irish variation of the popular mermaid archetype. The Watchful Eye. 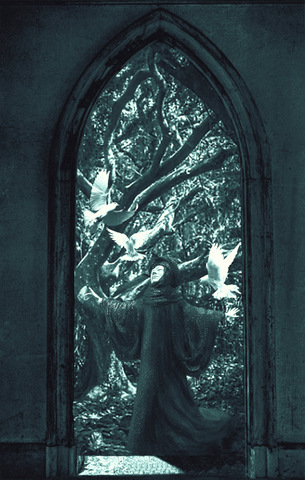 (Lesidhe) Guardians of the Forest. These guardians of the forest who are always disguised as foliage are classed as solitares. They can transform themselves into an animal or plant of any shape and size. They can also imitate sounds in the forest. 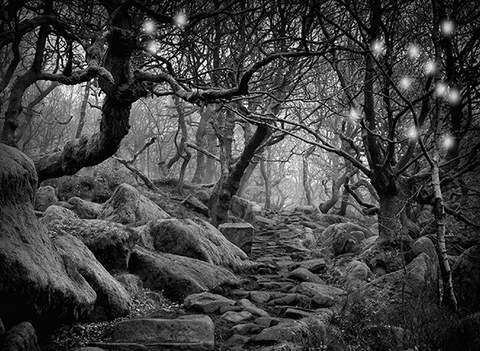 Walkers who go into the deep woods are often led astray by these spirits with the hope that they become confused and lost. 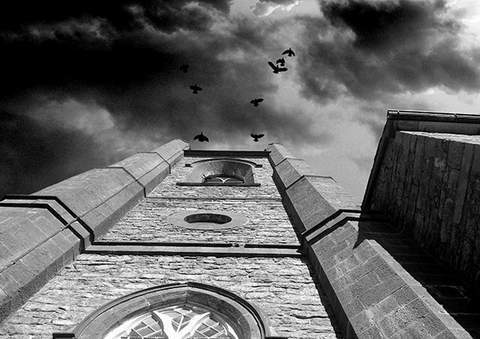 The Watch Tower. Achill Island. Ireland. 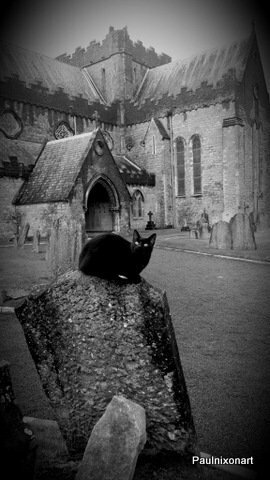 The Witches Familiar, St Canice's Cathedral. Kilkenny. Ireland. ​​I encountered this black cat inside the beautiful 13th Century Cathedral in 2016. As I walked down the center isle It suddenly ran across my path, disappearing beneath the pews on the opposide side. On leaving, the cat followed me outside only to pose in such a way on this headstone. The Hags Leap, County Leitrim, Ireland. A short drive over the road from where we lived is this wonderful natural mountain formation known as Eagle Rock or The Hags Leap. 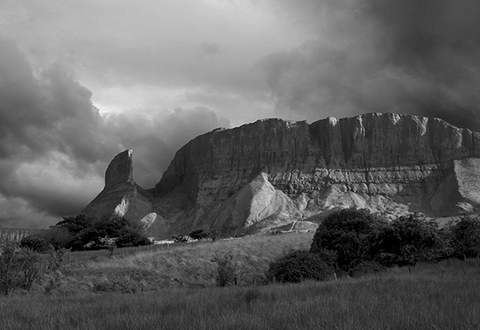 My grandparents and relatives would tell stories of a powerful deity, the ancient crone of wisdom who came in the early days of mans settlement on this island and is said to have let loose the rivers and shaped the mountains with her great hammer. As a child living with my grandparents I was immersed with these beliefs. 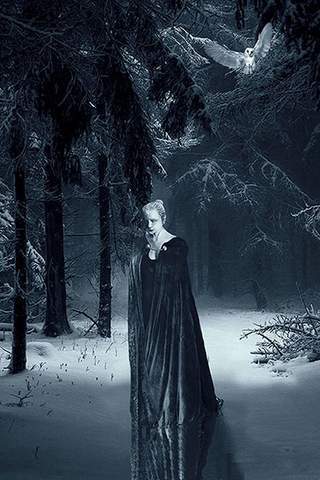 Sometimes laying beneath warming layers in the stillness of a frosty clear night as my breath rose like an apparition up into the frigid darkness, I could imagine the hags fearsome form ravaging all of natures finery. This place still echoes of her memory. She was said to despise the Summer months. She was the goddess of winter storms and loved wild weather, and had a fearsome appearance with one eye, an eye of perpetual keenness in the middle of a blue black face, and the teeth of a wild boar. Wielding a magical white rod made from either Birch or Bramble, she is sometimes seen leaping from mountain peak to peak blasting vegetation with frost. Her Druidic rod gives her power over weather and the elements. Every Summer as she gives way to her sister Bride, then turns to stone only to be reborn again every October 31st. She is otherwise known as An Cailleach Beara, meaning old wife, however she also had the ability to shape shift into a beautiful maiden. 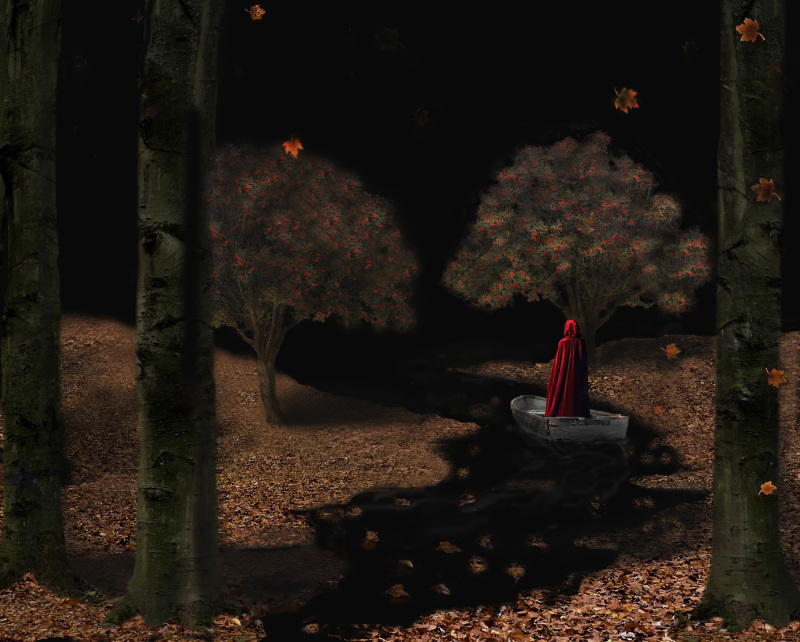 Ancient tales tell of her appearing to a heroic figure appealing for help. When the hero is able to see beyond the ugliness of her form, agrees and fulfills her wish she would then transform herself into a beautiful woman and offer herself as a reward. 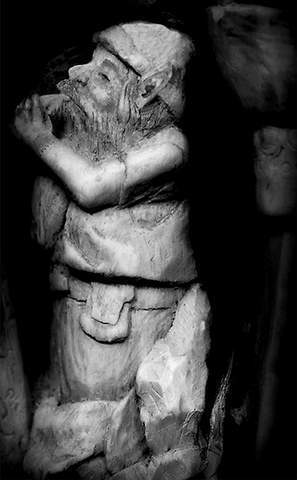 An Cailleach Beara is the hag aspect of the goddess and is known by many names throughout the Celtic world. 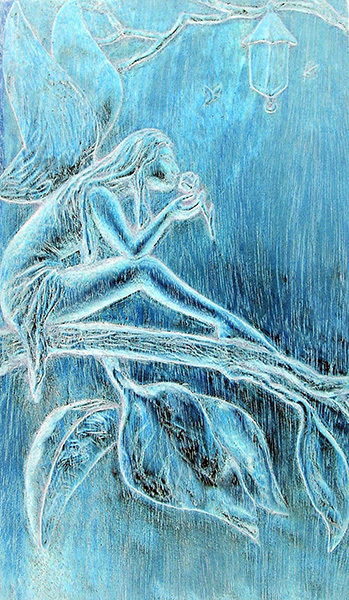 She is the Neolithic goddess of Winter and one of the oldest goddess known to Ireland. She has long survived the passages of time and is believed to have travelled across Europe to these shores with the receding ice age. November 1 St, a festival known as the reign of old women is celebrated each year and is known as the day of the Banshee. 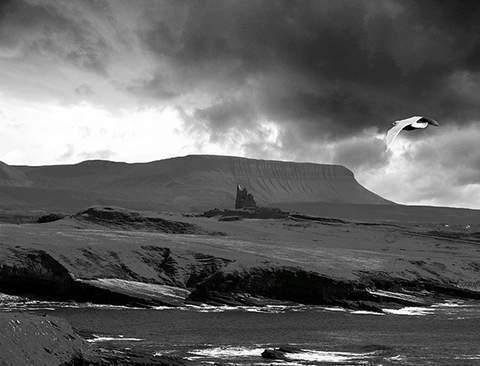 On the eve of Imbolc (Jan 31st- Feb 1st) also celebrated is the feast called end of Cailleach. The death of Winter and the coming of Spring. Her face was black, of the luster of coal and her bone tufted tooth was like rusted bone In her head was one deep pool-like eye swifter than a star in the winter sky. Upon her head gnarled brushwood like the clawed old wood of the Aspen root. When it has looked in glory from a cloud." 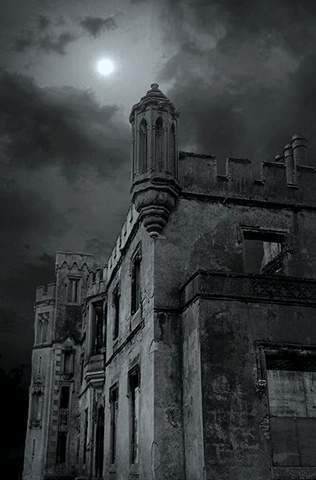 Duckett's Grove Castle. Carlow. Ireland. The Red Man Fairy trickster who induces nightmares. For the world is more full of weeping than you can understand." The fairy princess Niamh fell in love with Oisin's poetry and begged him to join her in the immortal islands. 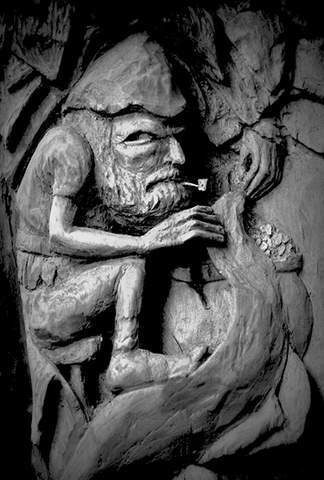 For a hundred years he lived as one of the Sidhe, hunting, dancing, and feasting. At the end of this time he found a spear washed up on the shore and grew sad, remembering his times with the Fenians. 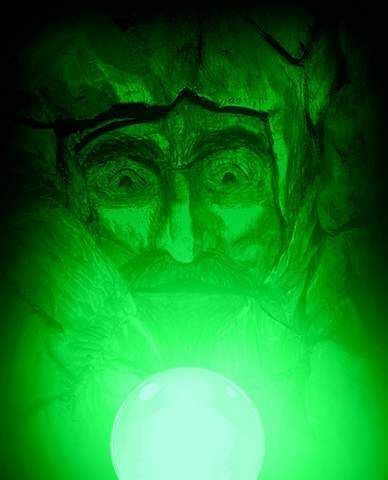 Niamh took him away to another island, where the ancient and abandoned castle of the sea-god Manannan stood. Here they found another woman held captive by a demon, whom Oisin battled again and again for a hundred years, until it was finally defeated. They then went to an island where ancient giants who had grown tired of the world long ago were sleeping until its end, and Niamh and Oisin slept and dreamt with them for a hundred years. Oisin then desired to return to Ireland to see his comrades. 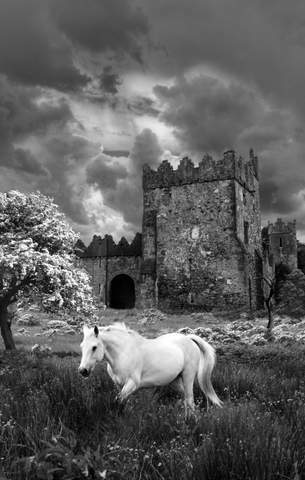 Niamh lent him her horse warning him that he must not touch the ground, or he would never return. 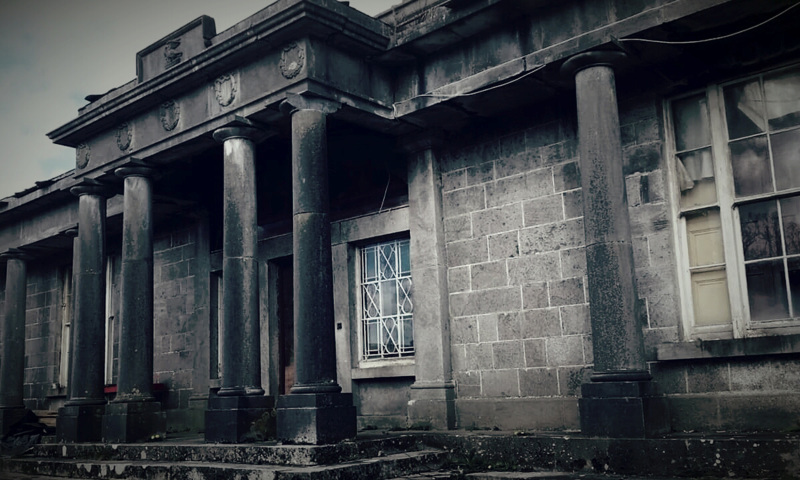 Back in Ireland, Oisin, still a young man, found his warrior companions dead, and the pagan faith of Ireland displaced by Patrick's Christianity. He then saw two men struggling to carry a "sack full of sand"; he bent down to lift it with one hand and hurl it away for them, but his saddle girth broke and he fell to the ground, becoming three hundred years old instantaneously turning to dust. ​ Through the castle window. In Celtic mythology, the Morrigan was associated with war, battlefields, death, and sovereignty; she could shape-shift into a crow or raven. Dating back to the Copper Age, she was the dominant Dark Death Goddess of Ireland, Wales and Britain. She is one of the original members of the Tuatha De Danaan (People of the Goddess Danu), an intimidating and fierce Goddess of sovereignty. The Morrigan exists between the worlds of life and death and the Celts believed she could revive their dead soldiers to fight once more. The severed heads on the battlefield were called the “Mast of Macha” (harvest of Macha). 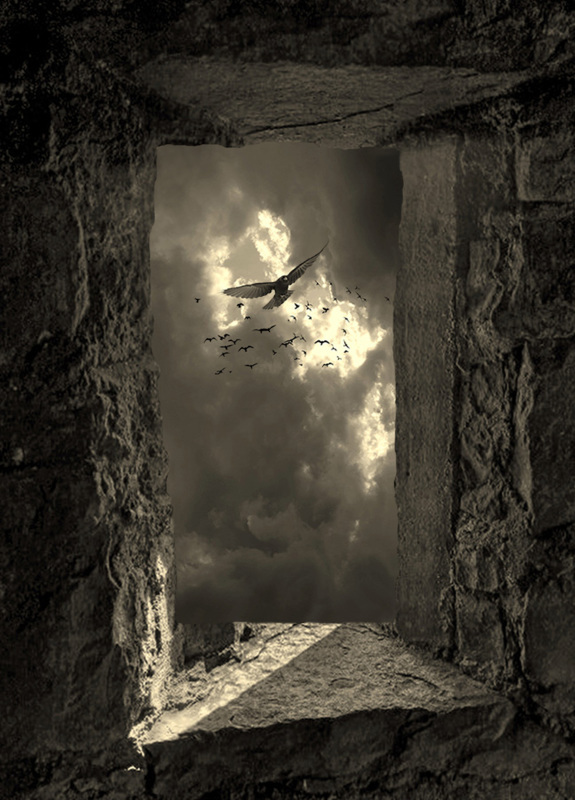 The ground was considered sacred after the battle, as the soldiers would leave until the next day so Morrigan could gather the souls undisturbed. The Ice Queen. How wide your gathering arms embrace to catch an orbit in flight. Spiteful winds that pierce y our space from cold unblinking eyes. Its stirring in this hush of nature brings a wild pleasure, surrounded by a single motion linking cloud and stone together. I sample its swelling taste in a cold soundless murmur, fading familiar scenes where wild creatures slumber. Perhaps the Ice Queen has seized her throne within the grandeur of these airy towers, the calm rustle of her lofty gown while her delicate tears devour. I pause a while in muffled tone an intruder within this expanse. My lagged patterns yield their form as flakes gather and dance. Here now your breath on tender lips cold bodiless and bright, licks as moist droplets slip to blend me from sight. As ivory wisps descend to the ground to hide the hopes of spring, are a whitewash of marvelous designs as though fashioned from a dream. 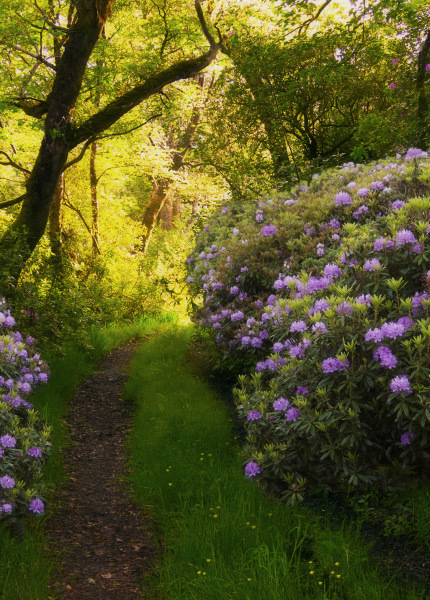 I make my way through a path of tales to leave behind this enchantment at hand. BeforeI am lulled by her delicate sway as her alluring insistence demands . Sculpted cement figure set into altered photography. 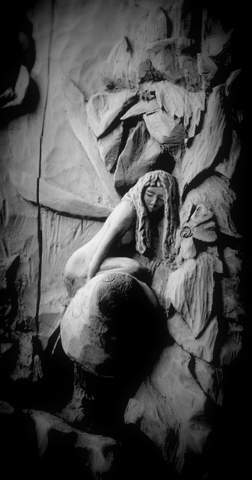 Celtic Merrow, Sculpted cement set into altered photography. These little characters for the most part are good humoured sprites, always helpful and obliging. However all good deeds must be rewarded. That goes without saying in the real world too, and the sprite world is no different. 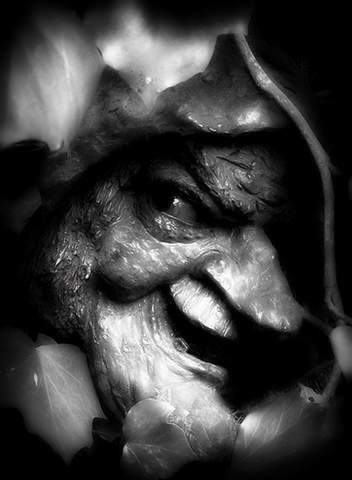 Hobgoblins do not like to be taken advantage of and so they feel it necessary for you to leave a little sampling of food, or something to drink for the little deeds they offer. As he busily plies his trade? 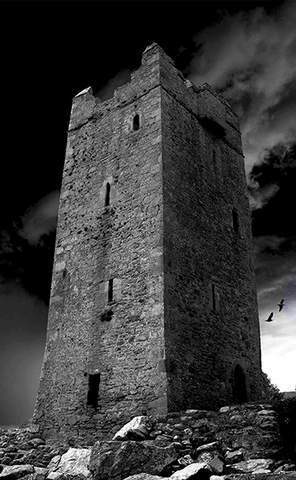 As a lover of Irish folklore and ghost stories, I sought out this castle on my last visit to Ireland in 2016. As it happened I had the castle all to myself. 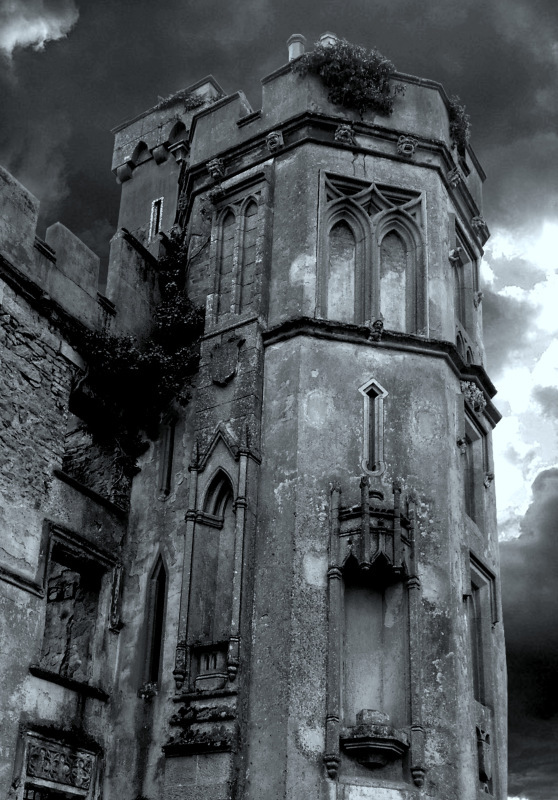 Ducketts Grove Castle has the reputation of being haunted which includes a Banshee that is believed to inhabit this tower. 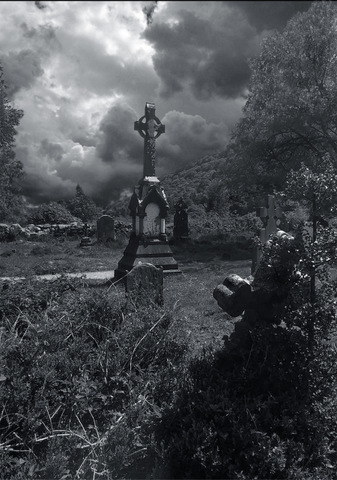 Drumcliffe Graveyard, County Sligo, Ireland. Cruel claw and hungry throat. Dark Woman of the Forest. Leanhaun Shee. “I was dancing with an immortal august woman, who had black lilies in her hair, and her dreamy gesture seemed laden with a wisdom more profound than the darkness that is between star and star, and with a love like the love that breathed upon the waters; and as we danced on and on, the incense drifted over us and round us, covering us away as in the heart of the world, and ages seemed to pass, and tempests to awake and perish in the folds of our robes and in her heavy hair. 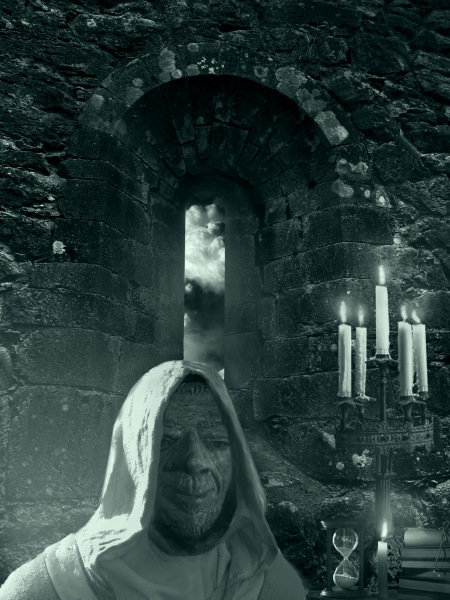 The Enchanter. ​Hand Carved Cedar Wood. 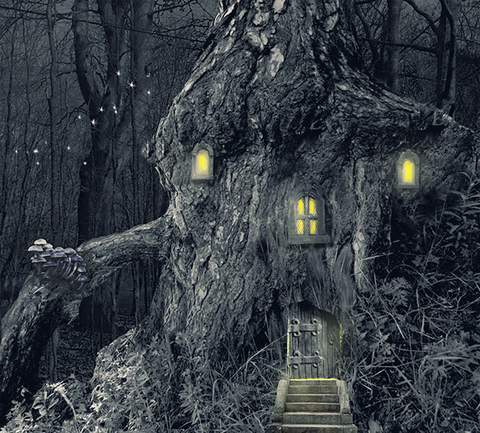 Do not think the fairies are always little. Everything is capricious about them, even their size. They seem to take what size or shape pleases them. 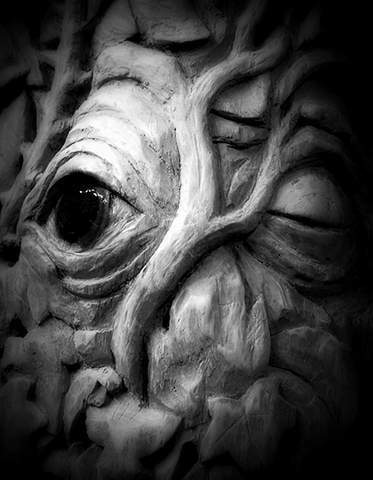 Phantom Fairy Creature.​ Hand Carved Cedar Wood. The Pooka seems to be of the famly of the nightmare. Its delight is to transform itself into a sleek black horse with sulphurous blazoned eyes, seeks out a rider whom he rushes through ditches, across rivers and over mountains, only to shake him off in the dull of the morning. Especially does it love to plague a drunkard. A drunkard's sleep is his kingdom. "Speak, speak, for underneath the cover there. The sand is running from the upper glass, And when the last grain's through, I shall be lost." Full Moon on Sacred Ground. 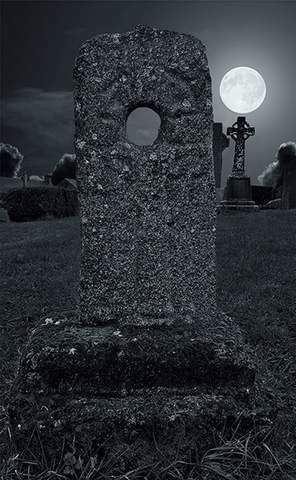 ​St James Graveyard, Castledermot, County Kildare, Ireland. "I believe when I am in the mood that all nature is full of people whom we cannot see, and that some of these are ugly or grotesque, and some wicked or foolish, but very many beautiful beyond any one we have ever seen, and that these are not far away.....the simple of all times and the wise men of ancient times have seen them and even spoken to them." 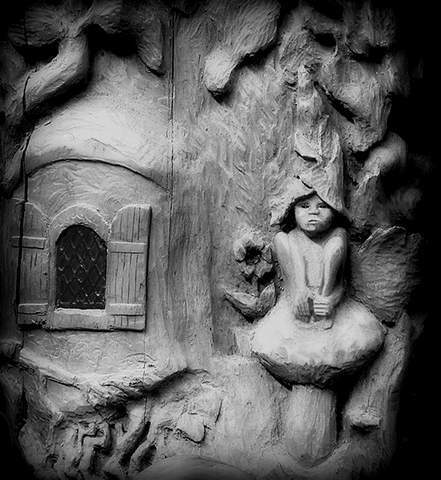 Flower Fairy Hand Carved Cedar Wood. 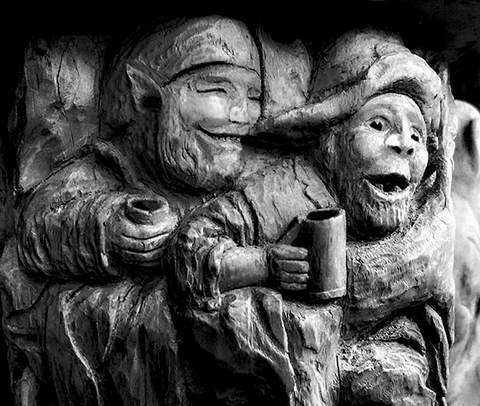 Mischevious fairies with a love of drinking and a tendancy to haunt wine cellars. 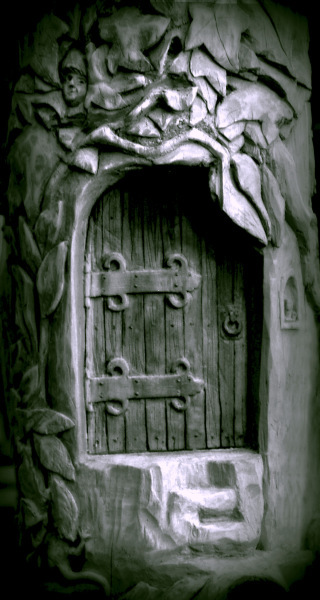 Hosting of the Sidhe (Faeries). 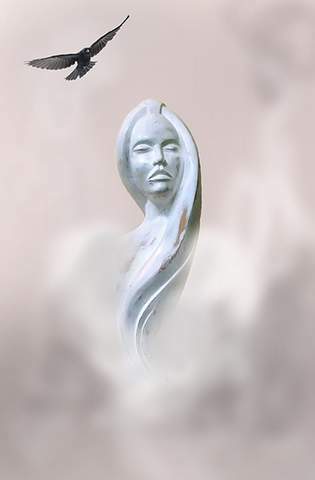 Sculpted resin figure set in created image. The Rise of the Morrigan. 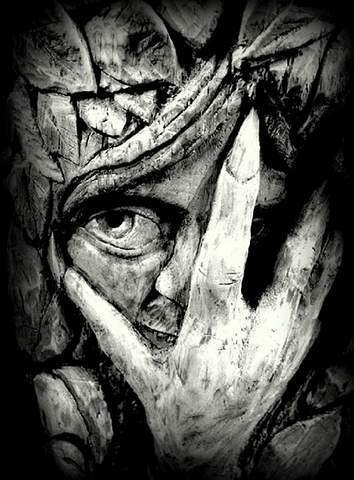 Sculpted wood figure set in created image. 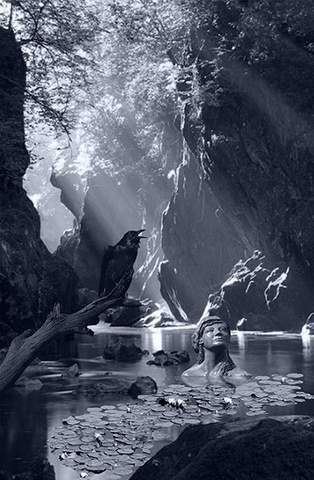 Dating back over 5000 years the Great Goddess Morrigan was the dominent deity throughout Europe. She is the transporter of souls between life and death. She is found where armies gather, where wars rage and where wisdom and warnings are needed. Only by appealing to her can a warrior become king or an army succeed. On the battlefield she appears as a crow where she can influence the battles outcome. 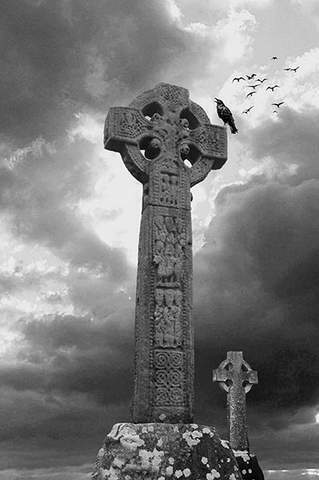 The Celts believed as they engaged in battle the Morrigan flew shrieking in crow form summoning a host of slain warriors to a macabre spectral bane. When the battle had ended the warriors would leave the field until dawn the next morning. Allowing the Morrigan to claim her trophies. Everything exists, everything is true, and the earth is only a little dust under our feet." 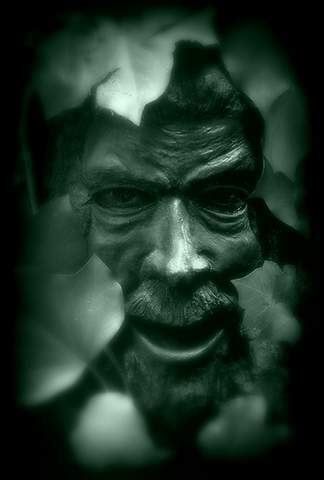 For thousands of years the Green Man is a symbol of mysterious origin and history. 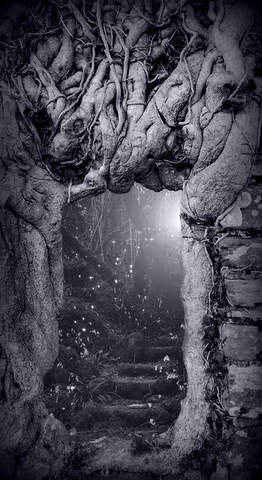 Associated with the Celts he is intended as a symbol of growth and rebirth, a forest god, an emblem of the birth,death, rebirth cycle of the natural year. Two hand carved and painted relief panels depicting Red Riding Hood and the Big Bad Wolf. 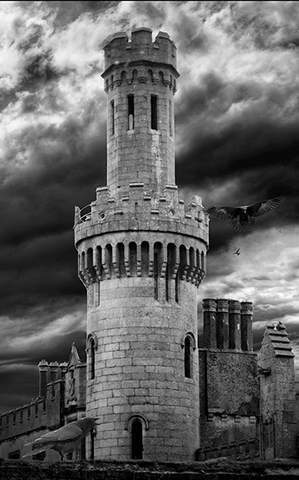 Halloween rendition of Clondalkin Round Tower, County Dublin, Ireland. Detached from every other song. But it is in this one." 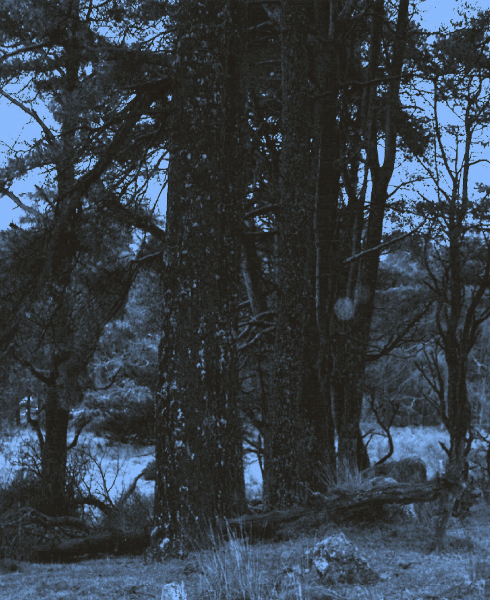 Two Orbs in a Wicklow Wood, Ireland. My Secret Door. Hand carved cedar wood. Hand carved Cedar wood, Paul Nixon. 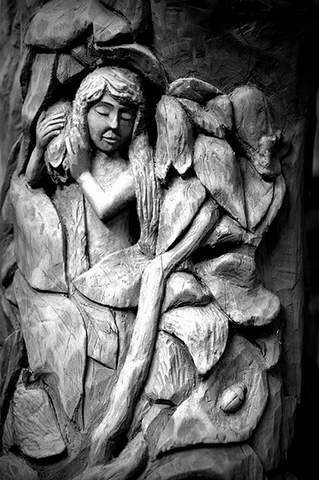 Hand carved woodland faery, Paul Nixon. 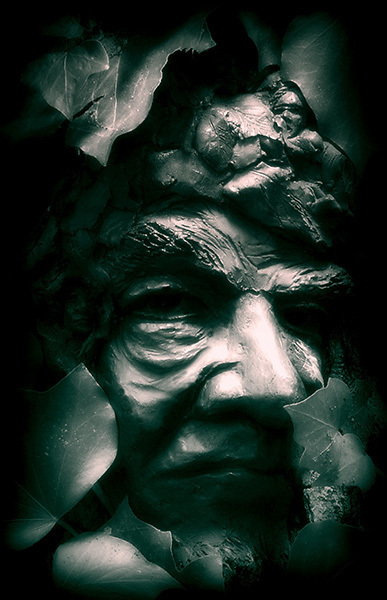 Sculpted cement figure set into digitally created image. 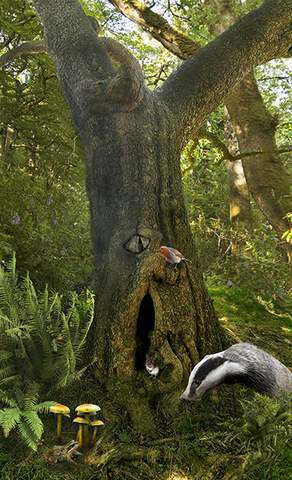 Luanantishee, guardians of the blackthorn tree. 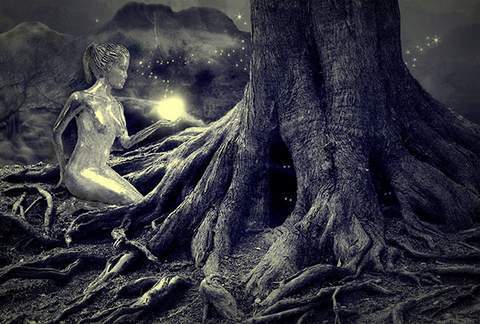 The Lunantisidhe is another type of fairy, and are protectors of the blackthorn tree. Although they appear to be thin and wrinkled looking they are very nimble for their old appearance. They have long pointed sharp teeth, pointed ears, long arms and fingers which enable them to move about the twisted thorn branches they call home. May is their height of the year as the blackthorn comes into bloom, and is timed with the first full moon called the flower moon. The Lunantisidhe live in groups are said to hate humans with a fiery passion. Lunantisidhe is an odd blending of the Latin word Luna (Moon) and the Gaelic sidhe (fairy). Their sole purpose is to protect the blackthorn tree from encroachment. The only time they will leave the trees it to pay homage to the moon goddess at the Esbats. ( Esbats are celebration of the 13 full moons that occur each year). They are lunar and represent the goddess at the height of her power. There are a few of the open-air spirits; the more domestic of their tribe gather within-doors, plentiful as swallows under southern eaves. My rendition of The Wind in the Willows. The Ferry Master, The final journey. 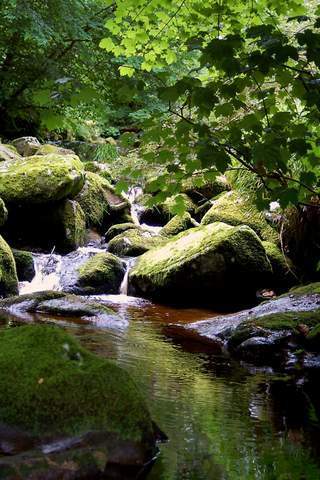 Cathbad also spelled Cathbhadh, in the Irish sagas, the great Druid of Ulster and, in some legends, the father of King Conchobar Mac Nessa (Conor). Cathbad The Druid. 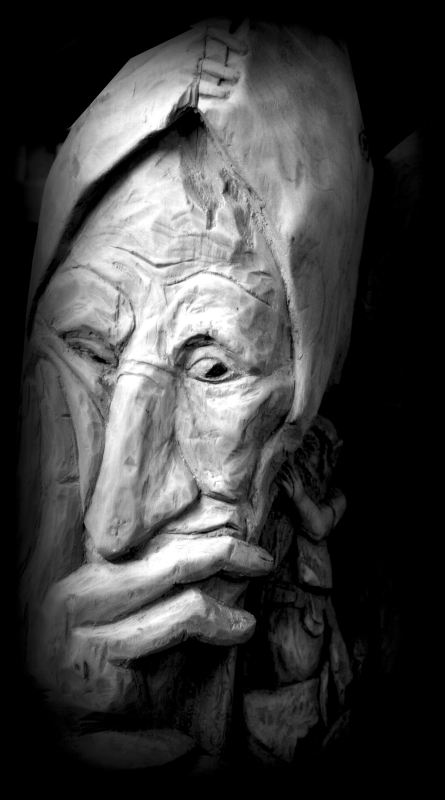 Sculpted cement figure set into a created image. Timeless Light. Glendalough, Wicklow, Ireland.